Dan Roy is a graduate of the San Francisco SPCA Academy for Dog Trainers. He earned his Certificate in Training and Counseling (CTC), with honors, under the tutelage of world renowned trainer, Jean Donaldson – author of THE CULTURE CLASH. Dan is a Certified Professional Dog Trainer (CPDT-KA) and a professional member of the Association of Professional Dog Trainers (APDT). Dan promotes a reward-based system of training. His approach to training is dog-friendly, but not over indulgent. “Setting boundaries for our dogs encourages a working relationship with them.” He stays on top of the latest developments in science-based training and client coaching by regularly attending workshops and seminars. 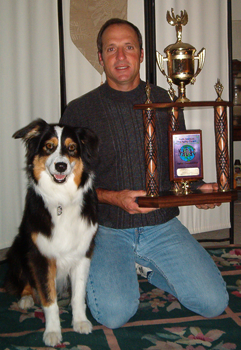 Actively training and competing since 1997, Dan and Australian Shepherds, Nala, Rifle, and Bug have earned some of the highest titles in Dog Agility. Out thinking an Aussie is no easy task. It requires boundless energy and an unwavering, upbeat attitude – qualities that come naturally to Dan. In fact, his closest friends suspect that he’s so good at his job because deep down, he’s a herder too. Dog owners are often faced with the task of locating a new trainer as their needs change. Dan has a broad training background and the experience to match. From puppies to adults, behavior problems to canine good citizens, and obedience to competitive agility, Performance Dog Training offers the benefits of one-stop training and activities. Dan relies on reward-based training methods to teach dogs to listen and respond to owner commands. Rather than wait for a dog to do something wrong, Dan encourages, recognizes, and rewards a dog for doing something right. By finding what a dog likes and then using it in training keeps them invested in the learning process. Dan’s client’s are amazed at what their dogs are able to do. In short, his clients and their dogs learn more and they learn faster. Take training one step at a time. Progress toward a pre-determined goal. Use learning theory to advance the training progress. Introduce challenges in a way that promote confidence and teamwork. What can you expect when you work with Dan? You will accomplish much more. Your dog will develop a love for training and will look forward to working, learning, and spending time with you.